Jane Smith is not one of Crossroads' most glamorous characters. Not for her the trendy elegance of Jill Richardson or the casual style of Kelly. In fact in many respects you could call her a 'plain Jane' type. Yet it is Jane's very plainess and kindly, down-to-earth qualities which have endeared her to the thousands of Crossroads fans who watch each week. Working as a waitress, Jane always has a kind word and a cheery smile for the faces around the Motel, whether they are well-known or unfamiliar. Happy in her job, she enjoys home life too, settled in a flat with Diane. Yet, as veteran viewers will know, life hasn't always been so rosy for Jane. She had a disturbed background, with the implication that her mother was a prostitute. These days Jane, perhaps because of her past, has thrown herself into work as a member of the Salvation Army, and part of her great appeal is the way she is always ready to help others. 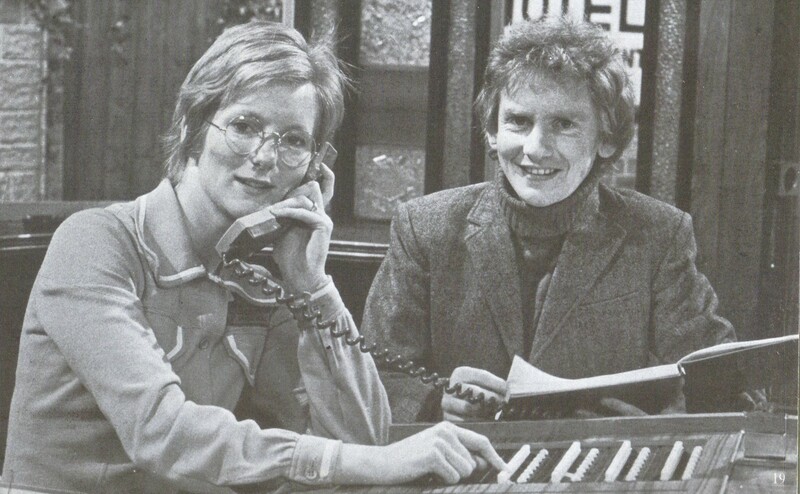 Sally Adcock, who plays Jane, smiles when she remembers her debut in Crossroads, about six years ago. She appeared for just one week, but a year later she was back and has been in the cast ever since. Like everyone else, though, she takes breaks, sometimes for holidays and at other times to do different types of acting. This necessitates the scriptwriters inventing plausible reasons, which is why a while back Jane contracted a nasty dose of pneumonia and had a long convalescence! Sally was born into a theatrical family, and her acting career has been long and varied. There have been appearances in theatres around Britain, a children's TV series, even a horror film! Now married, Sally and her husband relax in a cottage they have renovated themselves in Wales ... when Sally's not hard at work on the next Crossroads episode, of course!